At face value, the term "independent cinema" is simply used to classify movies that are produced outside of the major studio system -- but at its most pure and untethered core, that phrase has also gone on to define a broader filmmaking spirit. A spirit stripped away from box office statistics, big stars, and all the glitz and glamour of Hollywood. A spirit marked by limited means, resourceful creativity, and unfiltered passion. 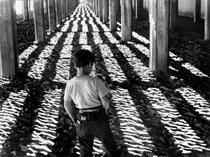 From Ray Ashley, Morris Engel, and Ruth Orkin, 'Little Fugitive' is a pioneering and highly influential testament to that very spirit. A classic piece of low budget, inventive moviemaking, the 1953 film is a delightfully unassuming gem filled with endearing heart and charming ingenuity. The simple story follows a seven-year-old boy, Joey (Richie Andrusco), who loves cowboys and horses. When his older brother, Lennie (Richard Brewster), plays a mean-spirited prank on him, Joey is tricked into thinking that he's killed his sibling. 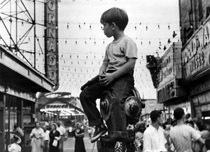 Fearful that the police will come after him, the young boy flees the scene, and ends up hiding out in Coney Island. As Joey enjoys the boardwalk's numerous attractions, Lennie realizes that his joke may have gone too far, and eventually sets out to look for his "fugitive" little brother. The overall narrative really couldn't be any more straightforward, and while there are marginal conflicts sprinkled throughout the runtime, the script mostly avoids conventional dramatic beats. Instead, we simply watch Joey being Joey. 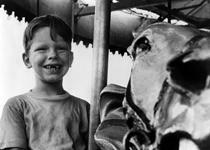 Extended sequences focus on the fun-loving little boy as he goes about his day playing carnival games, riding the merry-go-round, and eating hot dogs. When he finally runs out of cash, a slight obstacle is thrown his way, and soon Joey learns how to collect discarded bottles in order to trade them in for money. The storytelling is all incredibly basic and clear-cut, but the earnest and creative manner in which the directors and performers present the material elevates the movie to a surprisingly affecting level. This is the bare essentials of no-frills scripting, with all the unnecessary fat and bloat whittled down to pure emotion and soul through passionate, expressive filmmaking. A key inspiration for Francois Truffaut and the French New Wave, the movie makes frequent use of real locations and many non-professional actors. To capture it all, filmmaker Morris Engel employs a specially designed hand-held 35mm camera, bringing a fitting documentary style to the proceedings that perfectly conveys the playful essence of 1950s Coney Island. This unobtrusive fly-on-the-wall aesthetic goes on to depict numerous unwitting, and blissfully unaware extras, giving the directors the freedom and range necessary to record all the lively, unpredictable sights. While this level of reality is impressive, the style also lends itself to a few poetic embellishments, using the handheld movements to add a welcome sense of free-spirited excitement and energy. Likewise, a few POV shots help to bolster the story's youthful perspective, further evoking the innocence and curiosity of childhood. There is just a wonderful sense of uncomplicated exuberance to the whole affair, that is perfectly capped off by some genuinely beautiful images -- including a particularly memorable shot that briefly focuses on tiny beams of sunlight shining through the boardwalk. Score and sound effects also play an integral part in the experience. Harkening back to the trademarks of silent cinema, long stretches of the movie are free from substantial dialogue, and instead rely on some carefully chosen music cues and effects to heighten the onscreen images. Eddy Manson's playful harmonica score is full of lighthearted abandon and wistful emotion. There is an almost cartoon quality to the manner in which melody and visuals are married, with several notes used to play up the characters' actions. Some inventive sounds and noises are also used to help reinforce Joey's childlike perspective, and much like the scripting and cinematography, the aural design proves to be incredibly simple but oddly effective, expertly enhancing the film's heartwarming tone. Joining the likes of Jackie Coogan in Chaplin's 'The Kid,' and Enzo Staiola in De Sica's 'Bicycle Thieves,' seven-year-old Richie Andrusco turns in one of the most infectiously endearing child performances to ever hit the silver screen. Andrusco had no prior experience with acting, and his casting proves to be a stroke of genius. The directors wisely know when to pull back and simply let the child be himself, and this candid, care-free quality leads to an amusingly natural character. Sure, some of his line readings are a bit affected (they had to be recorded in post and synced in later), but when Joey is simply left to his own devices wandering around the boardwalk, we're basically being treated to documentary footage of a real little boy having fun -- and it's quite amazing just how engaging and entertaining he is to watch. More than just great at being himself, Andrusco also does a solid job of handling the story's few dramatic beats, and he sells all of Joey's excitement, frustration, joy, and sadness effortlessly. The entire runtime really hinges on his performance, and he helps lend the movie that extra spark of magic that makes it so special. Serving as a defining example of American independent filmmaking, 'Little Fugitive' is a true original. Despite what its wonderfully modest charm might imply, this really is a genuinely important work of art that holds an invaluable place in movie history. While the modern independent cinema movement has gone through various ups and downs, occasionally losing its way to over-bloated film festival markets and starry allure, this simple, unassuming treasure from three intrepid and talented filmmakers, continues to shine brightly as a powerful tribute to raw independent production. 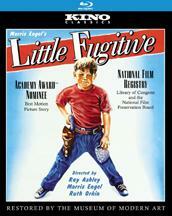 Kino Classics brings 'Little Fugitive' to Blu-ray on a BD-50 disc housed in a keepcase. After some warnings and logos the screen transitions to a standard menu. It should be noted that the menu music is distractingly loud, so you might want to dial down your volume before starting the disc up. Taken from a 35mm print preserved by the Museum of National Art, the film is presented in a black and white 1080p AVC MPEG-4 transfer in the 1.33:1 aspect ratio. Though it certainly shows its age and low budget roots, the movie still looks pretty good, and the filmmakers' modest visual ingenuity shines through. A moderate to light level of damage is apparent throughout, with some noticeable but not distracting scratches, hairs, vertical lines, and specks visible. A natural layer of grain is maintained, but can look just a tad static in a few instances. Clarity and depth are actually quite pleasing, showing off nice fine details in the various Coney Island locations and attractions. There is some contrast pulsing, and whites are a little blown out, but the overall grayscale is solid. With that said, the film's darkest scenes do look a bit faded and washed out. 'Little Fugitive' isn't exactly pristine, but it's wonderful that an independent gem like this has been preserved so lovingly, and the high definition presentation is very respectable. The audio is presented in an English LPCM 2.0 mono track. There are some age related issues, but the mix remains very listenable and certainly gets the job done. Dialogue comes through well but has a comparatively hollow and thin quality. Music and effects play an important role in the experience, and thankfully the score and playful Coney Island atmosphere are conveyed effectively. Dynamic range is adequate, but the sound does strain in the highest frequencies. Unfortunately, background hissing and static are audible periodically throughout, but while not ideal, these hiccups certainly don't ruin the track. While the mix isn't as clean as one might hope, the audio is still solid and the simple sound design and music prove to be an invaluable asset to the story. Kino has put together a nice collection of supplements, including a commentary and two short documentaries about the filmmakers. All of the special features are presented in 1080i with LPCM 2.0 audio and no subtitle options (unless noted otherwise). Audio Commentary by Director Morris Engel - Engel offers an easygoing, gracious, and enjoyable track that covers how he and his friends shot and produced the movie independently. The director also discusses the custom handheld 35mm camera designed for the shoot, and elaborates on how he went about working with the child actors. While Engle does spend a little too much time merely summarizing the events on screen, the commentary is also filled with many interesting anecdotes that are well worth a listen. Morris Engel: The Independent (HD, 29 min) - This is a 2008 documentary directed by Morris Engel's daughter Mary. The doc covers Engel's life and filmography, including interviews with his peers, admirers, and the man himself, revealing his lasting impact on independent cinema. Ruth Orkin: Frames of Life (HD, 18 min) - Here we get a 1995 documentary also directed by Mary Engel, this time about her mother Ruth Orkin who co-directed, co-wrote, and co-edited 'Little Fugitive.' Orkin's life and contributions are all traced through archive audio interviews and comments from her friends and peers. Stills Gallery (HD) - A gallery of 31 production stills and promotional shots is included in 1080p. Theatrical Trailer (HD, 2 min) - The film's theatrical trailer is included. 'Little Fugitive' is a seminal piece of independent cinema. The directors layer the simple story with palpable heart and a potent but unassuming style, and child performer Richie Andrusco effortlessly carries the picture with refreshingly natural charisma. The video and audio reveal the film's age and budgetary restrictions, but both are very faithful to their sources. Kino has provided a nice collection of supplements, including some great material with Morris Engel, one of the movie's key creative forces. While it's not particularly well known among many mainstream audiences, this is an enjoyable little gem of a film that should make a great addition to any cinephile's library. Recommended.